COLUMNA MESSIANIC RESEARCH CENTER: Now, GOD Finally Revealed His Chosen "MAN From The Far East" => LOPE COLUMNA of The Philippines! Now, GOD Finally Revealed His Chosen "MAN From The Far East" => LOPE COLUMNA of The Philippines! We are now in the 21st Century End-Time. And just before the glorious return of Christ as KING of Kings and LORD of Lords, many Secrets and Mysteries of the Kingdom of God must be revealed as prophesied (Daniel 12:4, 9, Hosea 6:2-3, Matthew 10:26, Mark 4:22, Luke 8:17, 12:2, Revelation 22:10 ). One of these secrets is the identity of the End-Time ravenous "MAN FROM THE FAR EAST" of Isaiah 46:11. Many religious leaders claim to be this "MAN." But, who is really the God-Chosen one? 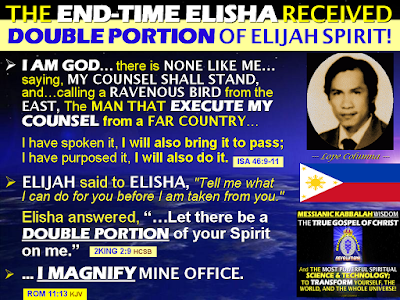 GOD now reveals to the world His chosen End-Time "MAN FROM THE FAR EAST," who is none other than LOPE COLUMNA of the Philippines! God anointed Lope Columna with the OIL of His Messianic Kabbalah Wisdom -- to EXECUTE or PREACH His Secret Counsel, which is the TRUE GOSPEL of the Kingdom of God (Isaiah 46:11, Matthew 24:14). In addition to the preaching of the EVERLASTING GOSPEL to the whole world, Lope Columna was also chosen by God to explain the root-causes and root-solutions to Climate Change disasters and other Global crises (Jeremiah 9:12). Naturally, many people, especially Filipinos, will ask the common question: "WHO IS LOPE COLUMNA?" And "How Can It Be Proven From The Bible That He is Really The Man God Called From The Far East?" So, to give the answers once and for all, I decided to write this series of articles about Lope Columna. Take advantage of these revelations, because there are many Great hidden Truths about Salvation and the Kingdom of God that will be revealed! For example, this article will introduce the Convergence of Heaven and Earth Sciences & Technologies, which is THE WILL OF GOD THE FATHER that will be strictly implemented by the KING of Kings in His 1,000-year Global Reign on Earth! Many People are asking, WHO IS LOPE COLUMNA? To know him, here are the HIGHLIGHTS of Lope Columna's Personal, Educational, Professional, and Spiritual Backgrounds. Lope Columna is an Electrical-Mechanical Engineer/Energy Consultant/Trainor who rose from the ranks to become a noted Corporate Educator in the broad field of ENERGY TECHNOLOGY MANAGEMENT (Human Factor & Technology Factor Management). He has more than 30 years of broad Engineering and Management experience. These include such diversified subjects on Power Generation & Utilization, Energy Systems Management and Efficiency improvements, Maintenance Engineering, Human Resource Development & Management, etc. He was given a US scholarship grant by the Philippine Government to study the advanced technology of Nuclear Power Plant Operation and Maintenance. As one of the Top Engineers of the Government-owned NATIONAL POWER CORPORATION (NAPOCOR), and as a USA-trained engineer; combined with the many tough on-the-job and classroom training given by local government institutions and private firms, Engr. Columna became one of the Best-Trained Energy and Power Engineers in the country. He is also one of the few Filipino Pioneers of Nuclear Power Plant Engineering in the Philippines. Scope of expertise includes Energy Management Systems (ISO 50001), Maintenance Engineering & Management, Safety Engineering & Management, Energy Education & Training, and Energy Consulting services in the Efficient Design, Construction, Operations, and Maintenance of Power Plants, Buildings, Factories, Facilities, Vehicles, etc. The above include such diversified technologies in Power Generation and Utilization, Manufacturing, Transportation, Materials Handling, Buildings and Facilities Management, Environmental Pollution Controls, etc. The major Machinery and Equipment of Energy & Power Systems include: AC Generators, Steam Turbines, Diesel Engines, Steam Boilers & Steam Systems, Pumps, Piping Systems, Fans & Blowers, Compressors, Electric Motors, Substation & Power Transformers, HVAC & Refrigeration Systems, etc. After leaving the National Power Corporation (NAPOCOR), Engr. Columna became the Pioneer of the Energy and Engineering training in the country. He rose from the ranks to become a noted CORPORATE EDUCATOR and TRAINER in the broad field of ENERGY TECHNOLOGY MANAGEMENT (Human Factor and Technology Factor Management), with more than thirty-years (30) of broad engineering and management experience. These include diversified subjects on Energy Efficiency improvements, Maintenance Engineering, and Human Resource Development and Management, etc. Guided with the principle, "ENGINEERING WITH VISION." Engineer Columna teaches Engineering not just for the sake of teaching Engineering, nor is he practicing Engineering just for the sake of Engineering practice. He always add to all Engineering projects the often neglected, but all-important element of VISION -- looking toward the future, to the long-term and lifelong benefits of Science and Technology to Mankind and Planet Earth. All of the Technical Training and Educational Services are offered under the Continuing Update and Refresher Education (CURE), developed by Engr. Columna. The main objective of this “CURE” project is to develop and produce a more educated and fine-tuned industrial workforce to face the triple crises of Energy, Economics, and Climate Change. And Engr. Columna's approach to this “CURE” education is not just for the learning of facts and skills, but the TRAINING OF MINDS TO THINK. Via the “CURE” regular technical training-seminars, Engr. Columna's advanced and visionary Training & Education were gradually transferred to industry and the academe. These energy training-seminars were conducted in-house and in public, and were attended by many participants (from Engineering Students to Engineering Managers from the Top Universities to World-Class Corporations), including OFWs from abroad. These also included participants from other Countries. Given a US scholarship grant by the Philippine Government to study the advanced technology of Nuclear Power Plant Operation and Maintenance. Involved with the construction, commissioning, testing, procedure writing, and maintenance of the first Philippine Nuclear Power Plant. Appointed by former Secretary of Energy, Sec. Delfin Lazaro, to be the HEAD AND CHAIRMAN of the Demand Side Management (DSM) group and to formulate energy policy to solve the national energy crisis. Developed and implements the unique ENERGY OPTIMA -- A NO COST/LOW-COST Integrated and Systematic Energy-Efficiency Management methodology designed to achieve maximum Energy Efficiency in Commerce and Industry. In 1993, Eng. Columna, through his first firm VISIONEERING-ENERGY SYSTEMS, was chosen to be one of the PIONEER TENANTS of the University of the Philippines Technology Business Incubator Project, Diliman, Quezon City. The TechnoPark project is under the Philippines Department of Science and Technology (DOST). THE UNIQUE RISE FROM BOTTOM-TO-TOP, MULTI-DISCIPLINARY BROAD EXPERIENCE, AND THE VISIONARY GOALS OF THE FUTURE: ALL COMPLETE THE 6 DIRECTIONS OF TOTAL EXCELLENCE IN THE RAVENOUS "MAN FROM THE EAST"! Before becoming a licensed engineer, Mr. Columna first worked as a FACTORY WORKER, then an ENGINEERING UTILITY HELPER, STEAM-BOILER OPERATOR/TENDER, an industrial MECHANIC, and a TECHNICIAN in many manufacturing plants. In NAPOCOR, he worked first as a NUCLEAR EQUIPMENT OPERATOR. 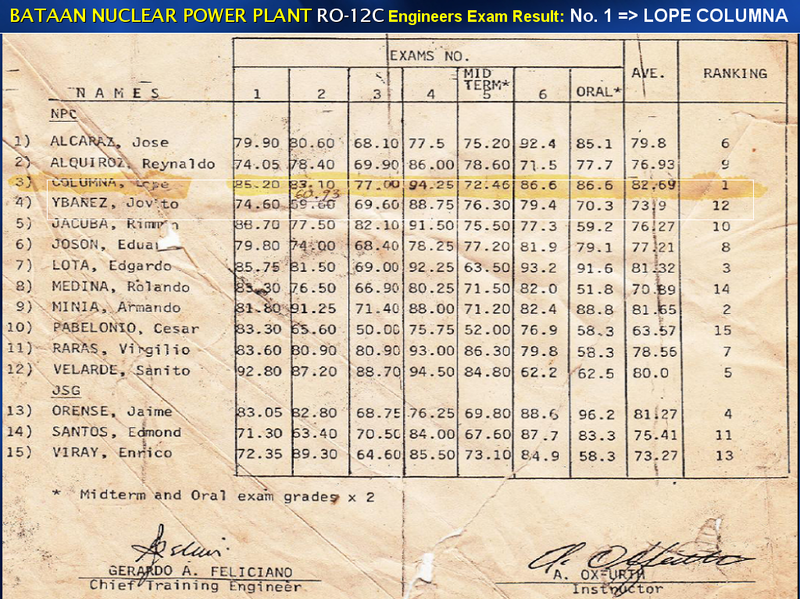 After passing a PRC Board Licensure Exam on Electrical Engineering, he was then promoted to become a NUCLEAR EQUIPMENT ENGINEER. And after his Nuclear Training in the USA, he was again promoted to become a NUCLEAR CONTROL ROOM SUPERVISING ENGINEER. 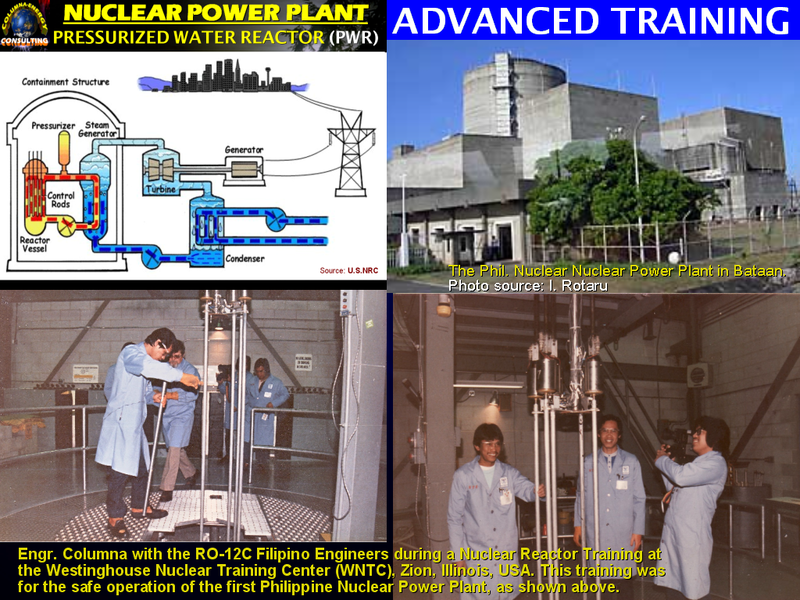 Also assigned the job of SENIOR NUCLEAR TRAINING TRAINING ENGINEER, serving as instructor to any of the Philippine Nuclear Power Plant (PNPP-1) training and retraining programs to which he is considered an expert. With all these jobs, real-life industrial and power plants exposure & experience, plus the many training, research, and lectures, Engr. Columna was exposed to personal knowledge and firsthand experience of the problems plaguing industries that result in the huge wastes of materials and energy that are released to the environment, causing environmental pollution and the Climate Change disastrous effects. BUSINESS MANAGER & OFFICE MANAGER, Philadelphia Church of God (PCG Philippines, Inc.). Directly manage and oversee the day-to-day operation of the Church, under the direction of the PCG Australian Regional Office and Oklahoma Headquarters. Also, as the Corporate Secretary, performs various functions in dealing with the various institutions in the country. TEACHER/TUTOR of the Competency-Based Refrigeration & Air-Conditioning (RAC) ElectroTechnologies of Clark Education City (CEC-AITMG), Pampanga. This is an Australian-owned and managed Training and Management Corporation. He was also assigned to be the Supervising Engineer of Engineering, Construction, and Maintenance of Clark Education City campus. ENGINEERING MANAGER of SHAQ Paper and Plastics, Co. Ltd. Here, he is responsible for the Energy Efficiency Improvements, maintenance, renovation, and construction of three (3) Manufacturing Plants. ENERGY/POWER CONSULTANT of Energy & Utility Services of Singapore, and of KANOO Power and Industrial Projects of Saudi Arabia. He was sent to the Kingdom of Saudi Arabia (KSA) to study its Power and Energy Services Market. ENERGY CONSULTANT of Energy Development Corporation (EDC), MAGBU Units 1 & 2, Geothermal Power Plants at Mount Apo (5 Months). The present MANAGER and ENERGY/POWER CONSULTANT of the COLUMNA ENERGY CONSULTING. The Founder and PASTOR GENERAL of the genuine BRIDE OF CHRIST Ministry of Life. The PIONEER and THE ONLY PREACHER OF GOD'S EVERLASTING GOSPEL or the MESSIANIC KABBALAH COUNSEL in the whole world, introducing the Convergence of Heaven and Earth Sciences & Technologies, to prepare the way for the glorious return of Christ and the establishment of the Kingdom of God on Earth! 1. The Philippine Government under the Dept. of Education, Culture and Sports (DECS) recognized Mr. Columna's struggles for work and education by incorporating his life story in their Social Studies textbook titled, "LIPUNAN" (first edition, 1981) -- a required reading for all first year high school students all over the country. Lope Columna's values and struggles for work and education was used as an inspiring lesson and model for all Filipino youths and students. 2. NPC Bulletin (Sept.-Oct. 1988 issue), the company newsletter of the government-owned and controlled National Power Corporation (NAPOCOR), reprinted the article from the Philippine Panorama magazine, in the title, "THE ACHIEVER," with the following editor's note: "... The NPC Bulletin is reprinting the article with some modifications and updating, because of its Moral and Inspirational Value and Educational Significance." 3. Featured in the "Great Little Lives" series of the Philippine Panorama Magazine as "The Poor Boy from Masbate -- A Young Man with Plenty of Nothing but Guts," published July 8, 1978. 4. CERTIFICATE OF RECOGNITION for having been nominated by NAPOCOR to: THE FIRST MERALCO FOUNDATION AWARD FOR WORK ATTITUDE, December 14, 1983. 5. OUTSTANDING STUDENT AWARD, Class 1973 Masbate National Comprehensive High School (formerly Masbate High School). 1. PRC licensed Registered Electrical Engineer (REE lic. No. 0021519). 2. PRC licensed Certified Plant Mechanic (CPM General, lic. No. 5282). 3. Topnotcher of the month-long competition/qualifying training and examinations attended by 35 top engineers of NAPOCOR and MIESCOR. Ranked no. 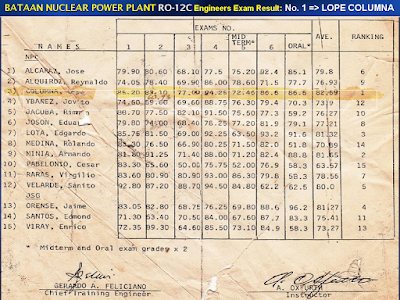 1 by exams result and the combined judgment of NAPOCOR, EBASCO Consultants International, and WESTINGHOUSE Electric Corporation. 5. Senior Reactor Operator (SRO) Written Audit, given by Westinghouse Nuclear Training Center (WNTC), Zion, Illinois, USA, March 1985. Postgraduate Level: Westinghouse Nuclear Training Center (WNTC), Zion, Illinois, U.S.A. In the year 2002, God, via The Holy Spirit, started revealing to Engr. 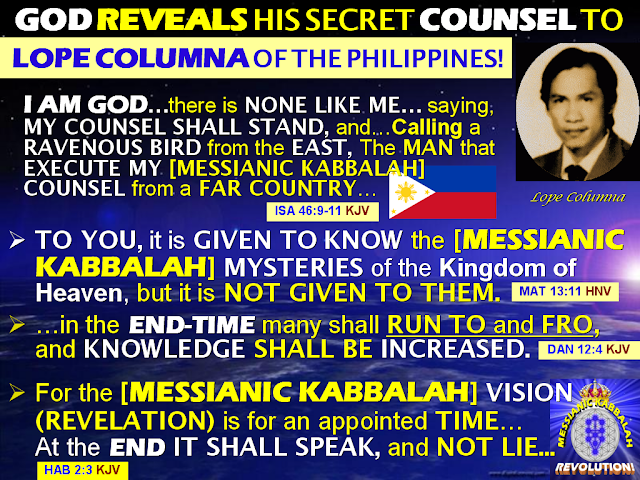 Columna His supernal COUNSEL of MESSIANIC KABBALAH WISDOM, which is the embodiment of all the Secrets and Mysteries of the Kingdom of God => The "DEEP THINGS OF GOD," (Isaiah 46:11,Matthew 13:11, Ephesians 3:18, 1Corinthians 2:7-10, John 16:13-14). And with God's special calling and anointing of LOPE COLUMNA, he became the First and Only Man on Earth who "EXECUTES GOD'S COUNSEL" after the Death of Apostle Paul. To "EXECUTE GOD'S COUNSEL" means to restore and preach the Everlasting True Gospel of the Kingdom of God (Isaiah 46:11, Galatians 1:11-12, Matthew 24:14, Revelation 14:6). The True Gospel was lost after the Death of Apostle Paul in the First Century. With his broad Technical Knowledge plus the Spiritual Messianic Kabbalah Knowledge given to him by God, Engr. Columna was inspired by God to initiate the CONVERGENCE of Heaven and Earth Sciences & Technologies, which is THE WILL OF GOD THE FATHER => The Message and Truth of the Everlasting Gospel of Christ Jesus! Engr. LOPE COLUMNA was then commissioned and anointed by God Almighty to be His END-TIME MESSENGER (Malachi 3:1). In other words, when the LORD God revealed to Lope Columna His "God's Counsel" (Isaiah 46:11), which is the Science & Technology of Heaven, The LORD also made Lope Columna the Pioneer in the world to introduce and apply the Convergence of Heaven and Earth Sciences & Technologies. This is the direction of the future technologies, especially when Christ rules this Earth. Thus, by the powerful inspiration and guidance of God's Holy Spirit, Engr. Columna became the Pioneer and the only Messianic-Kabbalist Preacher in the World; preaching God's Everlasting Gospel of the High and Deep Secrets and Mysteries of the Kingdom of Heaven (Matthew 13:11, 24:14, 1Corinthians 2:9-10). The side or edge of MERCY will empower God's People to prepare and be ready for the coming Marriage of Christ (Revelation 19:7). The side of JUDGMENT will be a strong witness against the People and Nations of this World who resisted and rejected this Wisdom. So, in the End-Time, Lope Columna is the only person on Earth preaching the TRUE GOSPEL OF CHRIST => The Convergence of Heaven and Earth Sciences & Technologies, in preparation for the soon-coming 1,000-year Global Reign of the King Messiah on Earth. This CONVERGENCE of the HEAVEN's Sciences & Technologies with the EARTH's Sciences & Technologies is the modern concept, as well as, the fulfillment of GOD THE FATHER'S WILL, without which NO ONE WILL BE SAVED (Matthew 7:21, 6:10, Luke 11:2). IN SUMMARY: LOPE COLUMNA is an Electro-Mechanical Engineer/Consultant/Corporate Educator with over 30 years of experience in the broad field of Engineering and Technology Management (Power Generation, Energy Systems Efficiency Improvements and Management, Human Factor Engineering, Facilities Operations and Maintenance Excellence, etc.). In the year 2002, God then started adding to Engr. Columna's broad Technical Knowledge His supernal MESSIANIC KABBALAH WISDOM, which is the embodiment of all the Secrets and Mysteries of the Kingdom of God (Matthew 13:11). By this Great Messianic Kabbalah Wisdom, Engr. Columna was also appointed by God to explain the Root-Causes and Root-Solutions of Climate Change disasters and other world crises (Jeremiah 9:12). Thus, by the powerful inspiration and guidance of God's Holy Spirit, Engr. Columna became the Pioneer and the only Messianic-Kabbalist Preacher in the World; preaching God's High and Deep Secrets and Mysteries of the Kingdom of Heaven (Matthew 13:11, 24:14, 1Corinthians 2:9-10). LISTEN AND LEARN from this God-Chosen "Man from the Far East"! You need God's pure Truth and supernal Wisdom for you to KNOW and DO the WILL OF GOD THE FATHER to be saved at Christ's return! THE GOD WHO IS NONE LIKE HIM (Isaiah 46:9) reveals these pure Truths and supernal Messianic Kabbalah Wisdom ONLY to Mr. Lope Columna. That's why THERE IS NONE LIKE LOPE COLUMNA when it comes to preaching the WORD OF GOD, especially that of preaching the TRUE GOSPEL to all the world for a witness to all Nations (Matthew 24:14, Revelation 14:6)! Continued on: WHAT DOES IT MEAN RAVENOUS? Who is The 'Ravenous Bird-Man From The Far East? Was It King Cyrus, Or Somebody Else? Lope Columna II For the response or answer to Edmond Macaraeg's comments and others, go to: Q353 of The BIBLE EXPLAINER. For whom was d "RAVENOUS BIRD" being called? V13 "l bring near my righteousness it shal not b far off and my salvation shall not tarry and I WIL PLACE SALVATION IN ZION FOR ISRAEL MY GLORY"
Was dat not CLEAR ENOUGH dat it is FOR LITERAL ISRAEL dat d RAVENOUS BIRD CAME TO SAVE ISRAEL FRM BABLONIAN CAPTIVITY? OR MR LOPE IS REFERING TO ITS PARALLEL SPIRITUAL FULFILMENT FOR "SPIRITUAL ISRAEL? Lope Columna II Mr. Danny Chan, for the answer to your insight, go to: Q349 of The BIBLE EXPLAINER. Francisco B. Rasco, Angelica Mejia, Lourdes Mojana and 2 others like this. Argie Dabalos Columna is the only person on Earth preaching the TRUE GOSPEL OF CHRIST --//////////////////////////////////////////////////////Pano yung mangangaral na nagtuturo mula sa BIBLE.mali na po pala sila lahat kc ayon sa pagkasabi nyo po...ONLY PERSON nag nagpepreatch ng TRUE GOSPEL OF CHRIST. Argie Dabalos Pag nagturo ako na MULA po mismo sa BIBLE..mali na po pala ako..kc Ayon sa Pagkasabi nyo po na si BRO.COLUMNA lang ang ONLY na nagtuturo o nagpepreatch ng TRUE GOSPEL OF CHRIST dito sa Earth. Lope Columna Argie Dabalos, For a complete answers to your questions, go to: Q350 of The BIBLE EXPLAINER. Lope Columna Richrd Neal, are you not afraid of the Great and Almighty God who chose and anointed Lope Columna to be His End-Time Messenger? You are not despising Lope Columna; YOU ARE DESPISING THE LORD GOD who chose and anointed him! Lope Columna Richrd Neal, your IGNORANCE OF GOD'S SUPERNAL TRUTHS cannot suppress GOD'S TRUTHS that are now being revealed! Lope Columna Sorry, Richrd Neal, you are disqualified to know God's Mysteries. The RESTORED TRUE GOSPEL OF MESSIANIC KABBALAH WISDOM IS MEANT FOR THE RIGHTEOUS PEOPLE ONLY. None of The Wicked Shall Understand! Only The Wise Understood, Purified, and Given Eternal Life (Daniel 12:10). Amanda Ronalter Omg lol. Nice try Lope Columna. False prophet con artist. You'll be exposed and burn in hell with the rest who intend to take the Glory away from God, His Son Jesus and the truth of His Word. I've seen your kind many times throughout my life. It won't end well for you. Amanda Ronalter I know. Just makes me angry and sick because I've been burned and seen lots of people I love get led astray by this exact kind of thing. Ronnie Sorima so what are the mysteries of the kingdom???? Ronnie Sorima nothing....hehehe. I never support false ministry. Ronnie Sorima Richrd Neal , ur absolutely right. Ronnie Sorima be patient, he"s studying science rightnow. We cant disturb him. Ronnie Sorima No, hes praying to John Travolta and Tom Cruise about Scientology...lol. Lope Columna The prophecy of JUDE 1:18-19 is fulfilled in this forum! Mockers and Atheists are prophesied to appear in the end-time generation. These are people who are stout-hearted, stubborn, and set in their evil and selfish ways. The Zohar describes these people as refusing to change the negative aspects of their natures. They seek not to embrace the path of spiritual transformation and the Light of the Creator, which is the Light of Messianic Kabbalah Wisdom. Those who don't strive to overcome become wicked. Ronnie Sorima What do u think whats ur doing ha? You call Wicked those who do not believe ur msge.,, Who"s mockers?? Lope Columna THEREFORE, DON'T BE MOCKERS! OTHERWISE, YOUR PUNISHMENTS WILL BE MORE SEVERE AND PAINFUL! Even though the spirit of mockery and atheism are prophesied to appear and influence many people in the end-time, you have the option to resist that spirit of mockery and atheism. Don't be a mocker of God's strange and wonderful work (Isaiah 28:21), which is hard to believe by carnal ungodly people. Sadly, most people will not believe, as in the days of Noah; even if biblical and historical proofs are shown and told to them (Luke 17:26, Act 13:41)! Lope Columna Ariel Paraiso Atijera, YOU ARE LOST and totally blinded by the god of this world (2Corinthians 4:3-4). Ariel Paraiso Atijera your pictures are no big difference with james owens and rekcart movement..
Nancy Gonzales Wue...there is no other God like JESUS.He's only the truth. Gugma Il Another false prophet? Ricky false prophet. the ravenous bird is Cyrus the Great. Lope Columna Gugma Il and Ricky, STOP conforming to the desires of your former IGNORANCE (1Peter 1:14)! God has lots of new revelations He is pouring down from Heaven only now given. Cyrus fulfilled only the Physical aspect of Isaiah 46:11. The SPIRITUAL aspect is being fulfilled only today. For more, study this revelatory article: The 'COUNSEL OF GOD' HAS TWO SIDES OF REVELATION AND EXECUTION: 1) The Physical Side is To Prepare Mankind For The First Coming of Christ (In The Physical Flesh). 2) The Spiritual Side Is To Prepare Mankind For The Glorious 2nd Coming of Christ -- The God-King Messiah! How many false teacher appearing especially these last days. Who do you want to deceive? me??? Lope Columna There is no need to deceive you, Gugma Il. You are already DECEIVED! Gugma Il Then you want me to believe you? Lope Columna You, and they, LAUGH NOW, CRY LATER. Gugma Il Did I laugh you??? Answer. Lope Columna I don't really give what is holy to the Dogs; neither do I cast pearls before Swine (Matthew 7:6). Gugma Il That verse boomeranged to you. Q. Why you did not accept what Christ said ..
Lope Columna It seems that most of the people here are IGNORANT OF GOD'S TRUTH. Vince E Ayeng Nako! Magpainjection kana, lumalala na ang kagat ng aso sayo. Roman Suarez Another chicken in the house. Noel Denola ayos to... masarap tanungin!!! Lope Columna WARNING AND REMINDER To all those people and mockers with a negative Anti-Christ Spirit: Are you not afraid of the Great and Almighty God who chose and anointed Lope Columna to be His End-Time Messenger? You are not despising Lope Columna; YOU ARE DESPISING THE LORD GOD who chose and anointed him! Lope Columna The RESTORED TRUE GOSPEL OF MESSIANIC KABBALAH WISDOM IS MEANT FOR THE RIGHTEOUS PEOPLE ONLY. None of The Wicked Shall Understand! Only The Wise Understood, Purified, and Given Eternal Life (Daniel 12:10). Ricky karamihan sa mga nagpapanggap na propeta ay lumuluwa ang bituka. Lumie Oporto I only believed Sister Ellen G. White and the Bible of course!